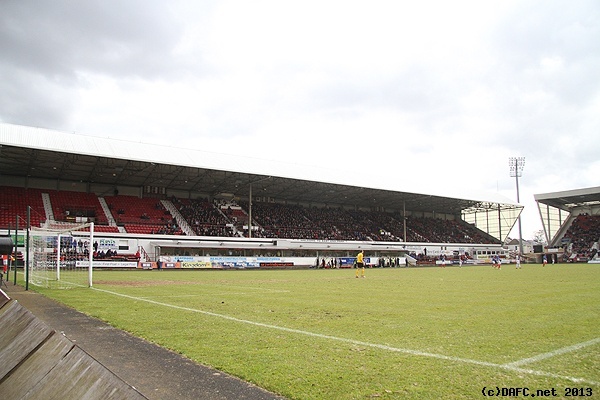 This was a crucial match with defeat for the Pars likely to consign them to the lottery of the play-offs. However, another gutsy and hard-working performance was rewarded when Stephen Husband scored the only goal of the game from the penalty spot, and as a result the Pars edge out of the play-off position. Stephen Husband puts this free-kick wide. There was good news on the team front – Husband was back from suspension, and Morris’s hamstring had improved enough to for him to be risked. Geggan and Wallace were still injured and there was still no sign of Dargo. That meant Jim Jefferies had a couple more options this week, and it being a home match, and pretty much a must-win one at that, he opted for his favoured 4-4-2. Hrivnak was in goals, Millen and Whittle the full-backs, but Morris returned alongside Young at centre-back. Husband came back into the middle of the park with Kane; Byrne started on the right and Falkingham on the left, although that was to change more than once during the 90 minutes, and Smith and Thomson continued as the strike-force. Potter dropped to the bench alongside Munro, where Henderson and El Bakhtaoui kept their places, as well as the sub keeper Goodfellow. That was a little bad luck for Drummond and Martin, but they will have opportunities soon. The visitors had a more defensive line-up – four at the back, with Cameron just in front of them, and Greg Stewart as the sole striker. Mark McKenzie would be one to be wary of, and he started wide on the left, although he is often to be found on the other wing. It was a nice warm day for a game of football, although the pitch isn’t in the best of nick, and it was still a bit blowy, which would prove additionally testing. Ryan Thomson v John Armstrong. After some initial confusion over who had kick-off, Cowden did the honours, and soon pumped the ball towards the Dunfermline goal at the McCathie end, Kerr Young covering his colleague and depositing the ball into the North-West stand. 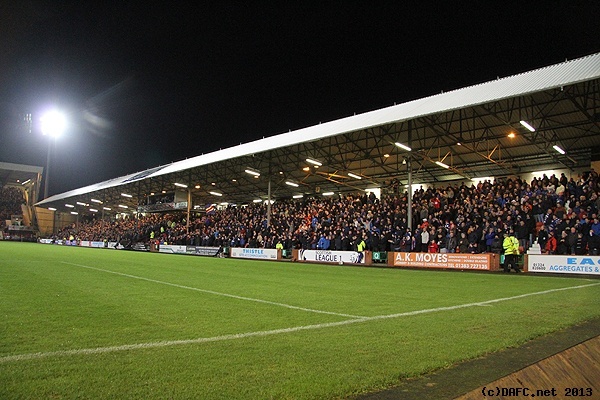 The Pars struggled to get the ball out of their own half for the first few minutes, before Byrne’s ball down the right touchline won them a shy, which Millen took long, aiming for Thomson, the ball bouncing off the back of a defender to give the Pars their first corner. Millen took it, and after the ball pinged about, it broke to Thomson who knocked it over the line from close range but the flag was up. The referee gave it as off-side, though there was a suggestion the ball had curled out from the quadrant. Soon after Falkingham was definitely given offside as he tried to get on the end of Thomson’s flick, this from another Millen cross. However the Pars were beginning to get on top. Husband had a chance from a free-kick in 9 minutes after Cameron had climbed all over Smith, but although he struck it sweetly, the ball whistled past the far post. Cowden keeper Flynn may not have seen much of that effort, but he was soon called into action, diving full length to intercept Falkingham’s cutback from the bye-line on 14 minutes, before tipping away Kane’s header from Millen’s cross 3 minutes later. Josh Falkingham and Ryan Thomson argue the case for offside. Falkingham was booked for simulation, this after he had missed a great chance. 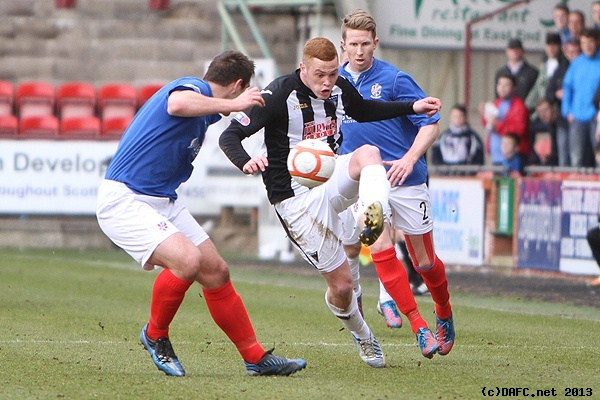 Smith had run at the Cowden defence on the left, and slipped the ball inside to Byrne, but with a shot beckoning, Shaun passed to Falkingham who was in a better position, but Josh took a touch and his shot was blocked; the Pars captain going down far too easily as he chased the loose ball. Alex Whittle v Mark McKenzie. The visitors had been on the back foot for most of the game so far, but began to have a better spell, and in 37 minutes Stewart made a great run, going all the way through the Pars defence, before shooting tamely at Hrivnak. Jim Jefferies wasn’t happy with something, and was subjected to a lecture from the referee, although he cheered up a little when the stand-side assistant got clattered on the napper with the ball after Adamson tackled Millen. 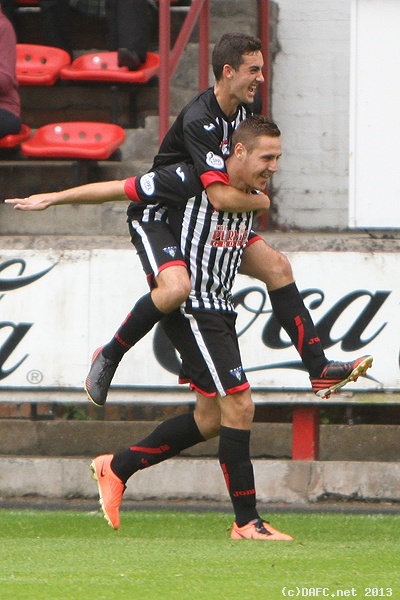 The Pars couldn’t create any more chances, although Byrne charged down Flynn’s clearance and was a little unlucky that the ball wouldn’t break for him, and Husband, having dropped a shoulder to glide past Cameron undid his good work with a poor touch. It was goal-less at the interval then, with the Pars perhaps a little disappointed not to be winning. The second period started promisingly for both sides, with Kane getting caught the wrong side of his man in the first minute and the Pars defence nearly being undone by an early ball over their defence, but Hrivnak was alert and diving at Moore’s feet to snuff up the danger. Instead, the Pars threatened themselves with a quick ball out from the back, and should have taken the lead when Falkingham sent Smith clear one on one with the keeper. Allan decided to shoot across the keeper, but Flynn got a hand to the ball, and completed a double save when Thomson had to stretch a little to get the rebound on target from 16 yards. Taken together, this was a bad miss, and one the Pars might rue as Cowden again looked dangerous for a bit, Stewart having a couple of half chances as the Pars struggled to clear their lines and Stevenson nearly surprising Hrivnak when his shot in 55 minutes seemed to take a bobble, but the Slovak stopper still beat the ball away.